Luke Donald shot an opening round 66 to share the lead at the RBC Heritage at Hilton Head in South Carolina. The former world number one knocked in six birdies in his five-under-par round to match South Africa's Branden Grace. Englishman Donald, 38, who is without a PGA or European Tour win since 2012, has slipped to 95 in the world rankings and considered retirement last year. Current world number one Jason Day bogeyed the last and is in a group of four one shot back. It was the Australian's only dropped shot and came after he took an unplayable lie at the closing lighthouse hole. Bryson DeChambeau, who posted the lowest amateur score at last week's Masters, shot a one-under 70 in his first round as a professional. 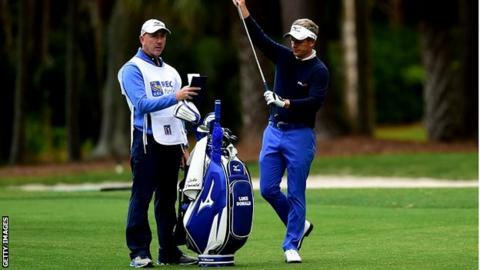 English trio Ian Poulter, Matthew Fitzpatrick and Greg Owen are alongside Scotland's Russell Knox on one over, while Paul Casey, who finished in the top five at Augusta, had three bogeys and a double bogey in his four over.